Book Review: Heavier Than Heaven By Charles R. Cross - GENRE IS DEAD! Since Kurt Cobain’s death 25 years ago, numerous books have been written in an attempt to figure out who he was. But only Charles R. Cross’ 2001 biography Heavier than Heaven gets close enough to give us an answer. Pulling from over 400 interviews with Cobain’s family and friends, this remains the most complete book about the late rocker. With unlimited access to his estate, Cross quotes from Cobain’s personal journals giving us a rare glimpse inside Cobain’s mind. The 2019 edition finally brings the lauded biography up to date. It’s a highly detailed account of his life from the moment he was born to his final breath. We see Cobain as a wide-eyed kid drawing Mickey Mouse for his grandfather to a misfit teen leaving graffiti across Aberdeen to a dedicated musician practicing for hours. Cross also shows us his struggle with addiction. Cross details Cobain’s battle to stay clean – his multiple stints in rehab, failed interventions, numerous overdoses and his own inner monologue scolding himself for being a junkie yet feeling trapped by addiction. He also highlights the dissolution of Nirvana. Looking back at Nirvana’s career, they seemed closed to each up until Cobain’s death. The heartbreaking truth was Cobain started isolating himself from the other members by riding in separate tour buses, not showing up to rehearsals, and even getting into violent altercations. But just like with his body of work, his death overshadows everything. Cobain’s untimely death has colored everything he’s done with many trying to find hidden meaning in his songs, videos, and his cryptic interviews. Cross adds to this tragic mythos by zeroing in on every mention of suicide or death in his lyrics or journals. He even goes so far as to imagine Cobain’s final moments as if to hammer in the point of what a tragic life he led. He did have a dark side, but it wasn’t the only facet of his personality. Cross rarely mentions the sweet, funny guy Cobain’s friends and family often talk about. At times it feels disingenuous because we’re only seeing Cobain when he’s unhappy when there was so much to him as other books and documentaries have shown us. The 2019 edition features a new introduction, seemingly geared towards the next generation of Nirvana fans, discussing how the era Cobain grew up in affected his music, and an afterward summarizing recent Nirvana activity, like “Sirvana,” the band’s impacting legacy, and their 2014 Rock and Roll Hall of Fame induction. One glaring omission is Montage of Heck – Cross makes no mention of the documentary, which is strange since it was a significant moment for the Cobain estate. While there’s no new information here, it’s a satisfying way to finally update the book. Heavier than Heaven remains the definitive biography on Kurt Cobain even 18 years after its release. No other book is filled with as much detail and insight on the late musician. It’s an intensely close reading of a musician who remains an elusive figure even in death. The book presents Cobain as a complex man fighting his demons while struggling with the pressures of fame. It’s a book new and old Nirvana fans will devour for a chance to get to better understand this iconic rockstar. 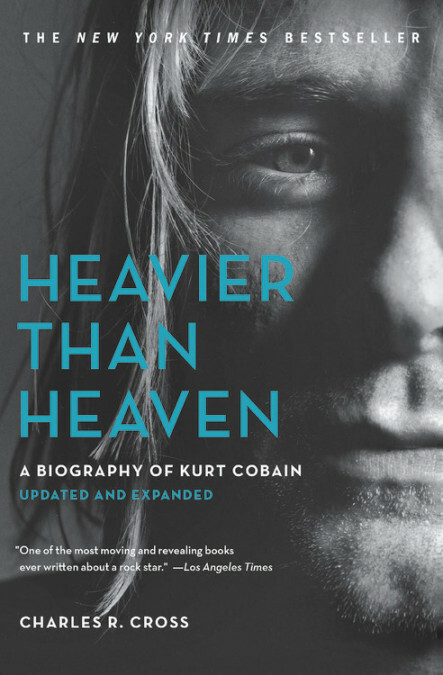 Heavier than Heaven is out now via Hachette Books.